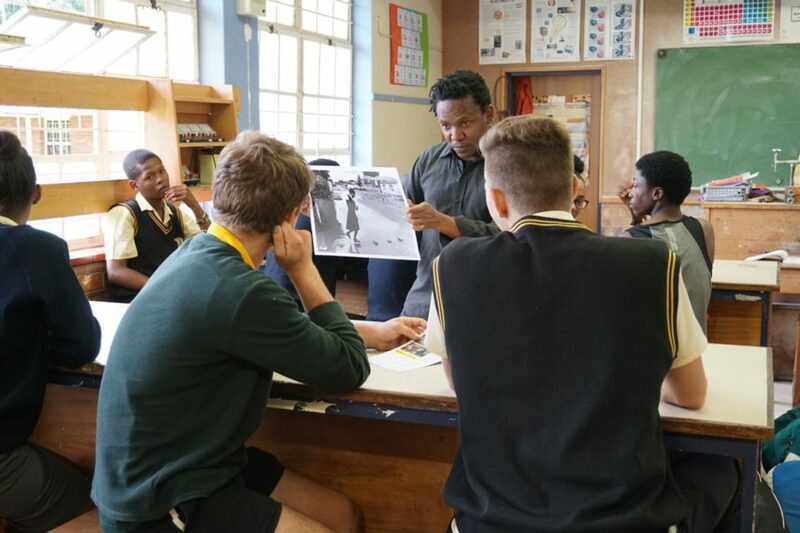 In February Ad van Denderen, Lebohang Tlali and a small team, Margalith Kleijwegt (writer), Sjors Swierstra (filmmaker) and Heleen Peeters (Paradox project manager) travelled to South Africa to research the possibilities for the project Welkom Today. Upon returning to the middle town 25 years since the launch of van Denderen’s publication Welkom in Suid-Afrika it was immediately noticeable that many changes had taken place. The static mining town had transformed completely. Today most of the mines have closed, it became hard to find work. During 1990 only white inhabitants were allowed to live in the city, today mostly black people roam the streets in the center. When discussing the plans and researching locations for the upcoming exhibition of Van Denderen’s archival photographs, the response was overwhelmingly positive. The city has no museum or cultural centers, the people are hungry for a place which teaches their history. Van Denderen’s photographs brought about many emotions. When bringing the book to the town hall, Kgojane Matutle, the spokesperson of the mayor became silent, he said ‘I am speechless’ and later upon agreed that the city will fully support the project. Alongside the exhibition, the team also visited several high schools in order to set up an education program. The young generate knowns very little about what happened during the apartheid era, yet they are affected by their past everyday. Welkom Today will set up an education program at three very different locations: Teto High School – a public school in neighbouring township Thabong, Welkom Gimnasium – a public bi-lingual mixed school and Goudveld Hoër – the only public Afrikaans-speaking school in Welkom. We look forward to collaborate and bringing these institutions that otherwise never meet more closely together. Get ready for more news during our next visit in the fall of 2017. In the meantime, follow the team behind the scenes on Instagram and learn more about Welkom and South Africa in general by following Margalith Kleijwegt’s weekly blog.